The Lazy Lobster - Corner Unit!! 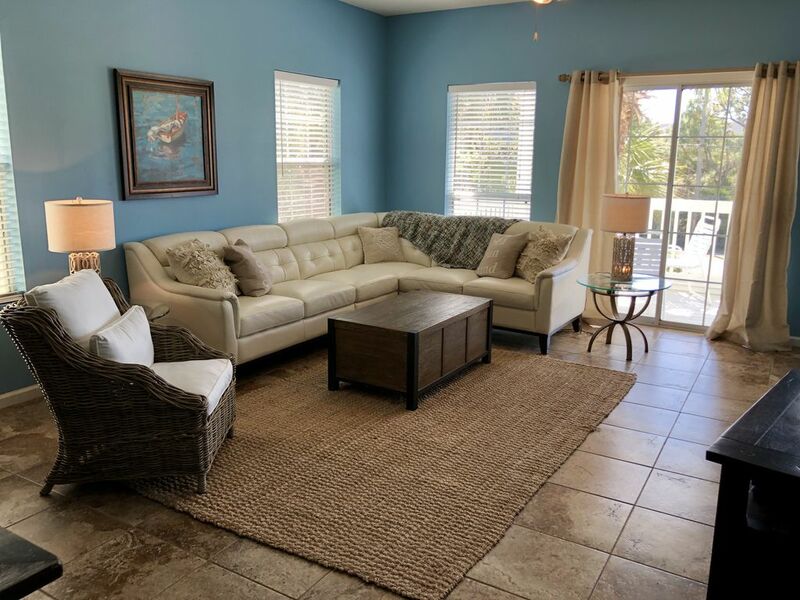 Come visit the Emerald Coast Beaches in a two bedroom, two and a half bath, large, 1400 square foot, Non-Smoking townhouse. It is just a short walk (150yds or 2 minute walk) to the semiprivate beach access. But if you would rather drive, there are 2 beach accesses with parking east and west of the Legends. Unit #301 is directly over the pool in the building closest to the boardwalk. Enjoy the sunrises and sunsets from the master suite balcony or the living room deck. Experience the convenience of overlooking the pool/hot tub and covered parking directly underneath. Unit #301 has granite throughout, stainless appliances, and bright colors. Spacious kitchen, living room, and bedrooms with separate laundry room. The master suite has a king size bed. The 2nd bedroom has 2 full size beds. An additional sleeper sofa is in the living room. Enjoy free WIFI for your convenience. If you're looking to exercise, there is a private tennis court and sand volleyball on the property. Enjoy the paved bike paths on scenic 30A. Keep the golfers entertained with the many golf courses including Santa Rosa Golf Club less than a mile away. Destin is just five minutes away with Silver Sands Outlet Mall, restaurants, and entertainment. Just one block away, take advantage of the free summer concerts, boutiques, and ice cream parlor at Gulf Place. We have loved Santa Rosa Beach and have been owners at the Legends since 2003. Once you experience a vacation along 30A, you will never want to go to another place filled with high-rises and crowds. The Legends is a great location where you can enjoy the beach, pools, hot tubs, tennis courts, and sand volleyball. There are miles and miles of a paved bike path that is perfect for biking or running along 30A. Our unit is the most convenient directly overlooking pool/hot tubs/courts and is in the building closest to the boardwalk. Great location for a trip to Santa Rosa Beach. Very roomy with all the comforts of home! This is our 2nd stay at the Lazy Lobster. It feels like home. The beds are super comfy with high end linens. It's very clean and Jennifer is always updating. The complex recently painted all the decks so everything is a crisp and clean white. Love having the hot tub just at the bottom of the steps at the veranda and the beach about 2 blocks away. We've already booked for 2020! Came down for the week of July 4th. Arrived an hour early as Lori and her husband were just finishing cleaning and was able to check in a little early. The place was immaculate!! It must have taken them hours and hours because the condo was spotless!! I love that we park under the condo so that the car was always shaded and there was plenty of room to lock up our bikes.There is a bike rental just 30 yards down the street. The condo is decorated beautifully and is quite spacious! All of the beds were extremely comfortable. The bathrooms are large and it was quite nice to not have to share a sink with my husband!! Kitchen has everything you need and I loved the full size washer/dryer so I could throw damp towels in at end of day! This condo is perfect location as it is a corner unit and we didn't have any traffic walking past our sliding doors on the shared 2nd floor balcony. It is also in the building closest to the beach. I prefer to stay on the beach, but this truly was second best! It is a very short walk on a private access road. Probably 100 yards at best! And we do spend everyday at the beach!! I was so pleased with the location of this condo in relation to the restaurants and shopping. It was literally a 5 minute walk to Gulfplace on one side and a five minute walk to our favorite restaurant The Local in the other direction. Excellent seafood all around. Also, Goatfeathers restaurant and seafood market was a minute walk away. The market steams gulf fresh shrimp with bay seasoning and has the most delicious smoked tuna dip! That was lunch daily!! Would definitely come back to Santa Rosa and would stay here again!!! Also, Seaside is a 5.2 mile bike ride from condo and totally worth an afternoon!! Our stay was great. Home had everything we needed. Our family had plenty of room in the home. I can't wait to come back next year. The property was nicer than advertised. We had everything we needed. We will definitely be back! We were very excited to be staying within walking distance to one of our favorite markets and restaurants, Goatfeathers. The property was bigger than it seemed from the photos and extremely clean. We had more than enough blankets, pillows,and sheets. The furniture was very comfortable. We had one small issue with the dishwasher but the owner responded immediately on getting it fixed. The master bathroom was nice and spacious. The porches had a decent View for not being Oceanfront. And we were literally just right above and to the left of the pool and hot tub. The beach is just a quick few minutes walk from the property. And even with the rain there was plenty to do in town and in the house. We can't wait to come back! What a wonderful trip to beautiful 30-A! The Lazy Lobster is just perfect for a small family. We have three kids (3, 5, and 7) and getting to the beach and back was a nice stroll for us all. Not far at all. The kitchen had all we need for making breakfast and a few meals at the townhouse. There were also a few puzzles stashed away that my boys loved doing while their sister napped. Thanks for a wonderful stay!